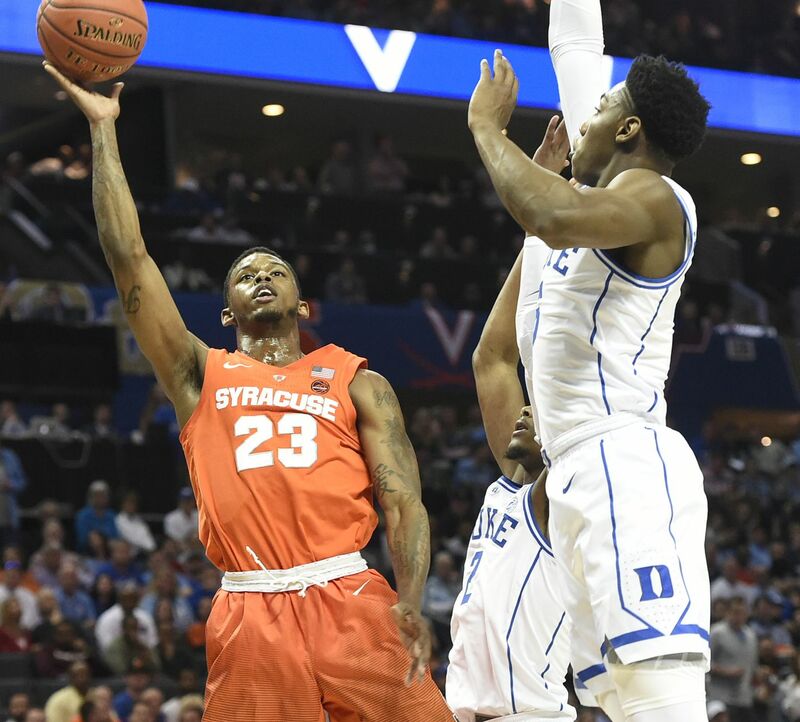 Syracuse entered the 2018-19 season as a trendy Final Four pick. They brought back every starter from a Sweet 16 a year ago and seemingly filled their offensive lull thanks to some recruits and transfers. But along the way, there were some roadbumps that led this Orange team to fall way short of expectations. A team that figured to be a top four seed got in as an eight and lost as a small favorite against an overachieving Baylor squad in the first round. 2019 clearly didn’t go as planned for the Orange as a team, but it also didn’t go as planned for certain individuals – both for better and for worse. Remember when people thought this kid was going to redshirt? That didn’t last long. He ended up starting the first two games of the season for the Orange and every single game of the postseason. Albeit his starts were solely circumstantial, not a single SU fan would have batted an eye if he was inserted into the starting lineup over the final 15 or so games. The freshman was clearly the standout of the 2018 class, despite his lackluster performance against Baylor. Boeheim figures to be a starter next season and could form a lethal shooting combo with incoming freshman Joe Girard. We all heard that Hughes would be an offensive spark plug, but all that talk only matters if you back it up. The East Carolina transfer did exactly that and proved to be one of the Orange’s most consistent scorers. He was a lights out shooter at times and dropped a career high 25 points in the tournament loss. There were times when he would disappear and Jim Boeheim would bench him, but there was miles more firepower than liability in Hughes. Don’t be surprised if he turns into a top five scorer in the ACC next season. After a long, successful SU career, the junior is headed to the NBA Draft. Battle’s numbers took an expected dip because there were other options offensively, but that doesn’t mean he had a down year. Sure he wasn’t as consistent as he was in his sophomore season, but NBA teams should look at him for how he handled adversity as a leader. When the team needed a big shot, Battle was the guy. When the team needed someone to be held accountable, Battle took blame. And when the team needed to fill a void or injury, Battle was the one plunged out of his position and into a new one. He’s one of the greats this program has seen both on and off the court. While his NBA stock may have dipped, his Orange stock ended with an upward pointing arrow. Last season, there was speculation that Brissett could leave for the NBA after a crazy NCAA Tournament run. This season, it was expected that he would leave for the league after picking up where he left off. But when the year got into full swing, a once anticipated lottery pick really no longer has choice of entering the draft this season. The critical parts of his game suffered this season, albeit not as bad as some fans may think. In fact, his overall field goal percentage rose four percent this year. But the areas that Brissett needed to improve in were his deep shooting, finishing around the rim and ball security. His three point percentage dipped six percent, his free throw percentage went from a strength to a weakness by dropping 12 percent, he average two turnovers per game. He improved his finishing around the rim by almost 10 percent, but it still was the worst amongst Orange starters. Brissett is still the best NBA prospect on this team, but he’ll have to make a big jump with his shooting if he wants to turn that into reality. This is an Arinze Onuaku level “what if” for the Orange. Howard was coming off of his best two game scoring stretch of his entire career, but violated an athletic department policy which led to his suspension for the tournament. Offense wasn’t the problem against the Bears, but defense was. Baylor was given a lot of open three pointers, which could have been closed out on by Howard. He was a defensive staple in the zone and was the savvy vet who was the only player to reach a Final Four. He had an up and down relationship with Orange fans, but the end seemed to be trending more towards up with a chance to leave a warm feeling in their hearts as he heads for graduation. Instead, he ends up as the scapegoat for a “what could have been” season. Carey started the season with a boom. His athleticism was on full display with coast to coast layups and a good handle. But the turnovers started to mount and his minutes diminished. ESPN recruiting expert Paul Biancardi said he was a Trae Young candidate in the sense that he was an underrated player who could take the league by storm. But we barely saw the team’s top recruit as the season came to a close. A guy who was expected to be an offensive spark off the bench registered 3.5 points per game in a dozen minutes. But all signs seem to point towards Carey having an excellent sophomore season. We’ve seen Orange point guards explode in their second seasons, and there’s no reason Carey can’t be next in that line. All indications pointed towards him having some of his best practices and not hanging his head despite a lack of minutes at the end of the season. Now, we’ll see if that can translate in 2019-20. Buddy can shoot, but that’s about all, I see Elijah Hughes at the 2 and Howard Washington at PG, if healthy. Braswell slides into the 3 as a Cam Johnson type wing who JB should’ve played more, Smooth, athletic with good defensive instincts, Marek at the 4 and Sidebe at 5. Howard Washington if healthy is a good defender and distributor and at this point, Buddy, Jalen, and maybe one of the freshmen with size can come off the bench and spell the forwards.